You can add an egg to the mixture if you like to bind the potatoes together. I skipped this ingredient because I used leftover mashed potatoes from the refrigerator. If you do use eggs, keep the ratio to 1 egg to every two to three cups of mashed potatoes. These potato cakes can be made in advance, and then reheated in a lightly buttered skillet or your toaster (or regular) oven. They are quintessential Irish pub food. My husband is Irish (from Dublin), and one of his favorite dishes was his mom's Irish potato cakes. Every time we visited his parents, his mom always made us these, and they were always such treat. As an Irishman, he loves potatoes. The stereotype is true, at least in our house. In fact, when I made the mashed potatoes for these potato cakes and tucked them into the fridge for later, he immediately noticed them. I assured him that potato cakes were in his future as long as he kept his hands off the mashed potatoes. These can be served plain with melted butter, or with onions, sour cream, and smoked salmon. It's up to you. I had some leftovers for breakfast with some of this homemade ketchup. Ah-maze-ing. I'm participating in Eat the World by Culture Eatz. Our plan is to make a dish from every country in the world and post our recipes on the 10th of each month. After the recipe, be sure to check out the rest of the wonderful dishes from the rest of the Eat the World members. Mix the mashed potatoes with the flour. Melt the butter in a skillet until bubbly. Scoop the potatoes with a half cup cookie scoop onto the surface of the skillet and gently press down with an oiled spatula. Sprinkle with salt and pepper. Pan fry the potatoes for several minutes over medium low, until browned. Flip the potato cakes over, sprinkle with salt and pepper, and continue to cook until the other side has browned. Repeat with the rest of the potatoes. Serve immediately. Check out all the wonderful Irish dishes prepared by fellow Eat the World members. Click here to find out how to join. 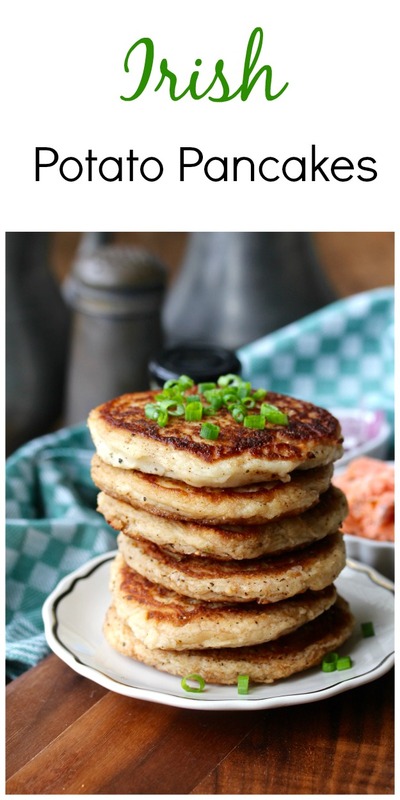 Love potato pancakes and this recipe sounds like a winner. Thanks Wendy. It's super easy. It's the flavor that matters, right? You should see the photos of the Irish rarebit I made for this post. Ugly bugly. We still ate it! Ha ha ha I love that you had to tell your husband to stay away from the leftovers. 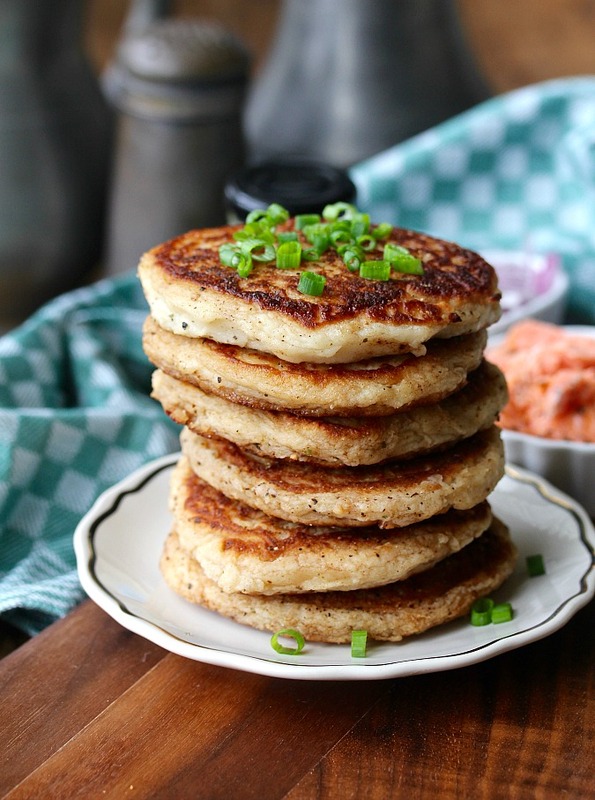 These potato cakes look so good. Time for a second breakfast lol. 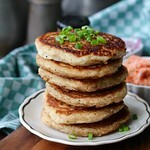 These potato pancakes look divine! I love potatoes as well, in every possible way, and as a pancake even better! Pinned and yummed too! Beautiful photos Karen! I could really use some potato cakes right about now. 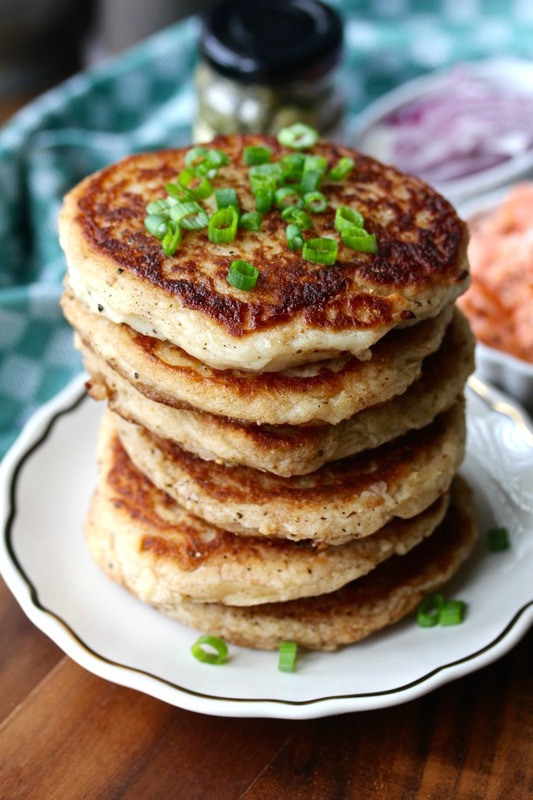 We love potato pancakes! Yours look gorgeous! Mmm, they look wonderful! I always say the mark of a true good cook is the ability to turn leftovers into something wonderful! Thanks Bernice! We love leftovers! Oh wow! What a delicious way to elevate leftover mashed potatoes! This is definitely going into my recipe rotation. I can think of all sorts of things to put on top of them. Mmmmm. . . .
Oh my goodness - do these sound amazing or what? I definitely need to give them a try!